This variety is one of the most vigorous and disease resistant of the standard varieties. It is resistant to Fusarium Wilt and resists blight well even in wet weather. Fruits are large, globe shaped, smooth and bright red right to the stem. Tomatoes are of tropical origin and like warm weather. Do not set outdoors too early. Maintain good fertility during the season. 10000 Seeds/oz. Plant 1/8oz per 100ft row. 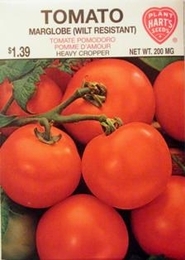 2lbs of Tomato seed needed per acre. 4oz needed per acre if using transplants. Average Tomato yield per acre - 741 bushels. On average, 1oz of seed can produce 3000 Tomato plants.